But can you really make that much money through a “done-for-you” system or is the Ecom Cash Crusher a scam? That seems to be the question on most people’s minds & I’m glad they’re asking it before jumping in because the Ecom Cash Crusher system is NOT what it seems. What Exactly Is The Ecom Cash Crusher System? Couple that with the fact that this system claims you can get a secret for making $40,000 per month for $37 (which sounds absolutely ridiculous) & it’s safe to say things don’t look promising at all. In short it turns out that the Ecom Cash Crusher is just a re-hashed version of the Ecom Cash Code scam that launched around 3 weeks ago at the time of writing this review. It looks like the creator is simply trying to launch the system under as many names as possible in an attempt to escape all the negative reviews that expose it as being as a scam. So the concept of it is that you’ll be learning how to setup an online store (hence the name Ecom which is short for Ecommerce) & selling products online through a method known as dropshipping. That’s why I always recommend affiliate marketing instead (which is much better & easier to find success with in my opinion) but you’ll soon see for yourself what I mean when I explain exactly how it all works below. How Does The Ecom Cash Crusher System Work? To be honest the Ecom Cash Crusher system is pretty darn misleading. Right upon landing on the website you’re told that you’ll be getting access to “the biggest money-making secret” along with an “incredible & revolutionary system”, however none of those statements are true. The method the Ecom Cash Crusher is based around is NOT a secret (it’s far from it) and there isn’t actually any system at all. If you spend your money on the Ecom Cash Crusher (which I definitely don’t recommend) all you get access to is some training, not a system. …and it’s just pretty basic training that you can actually get elsewhere for free. So like I mentioned in the previous section of this review what you’ll be getting access to if you buy into the Ecom Cash Crusher “system” is some training on a method called dropshipping which involves selling products online. Now dropshipping seems like a really attractive business model because the way it works is that you actually make sales before you purchase the products – so it seems on the surface like you can’t lose. But let me tell you when it comes to dropshipping you can (and most likely) will lose. It takes a LOT of work & in my opinion is way too risky. The reason for that is because essentially you’ve got to arrange deals with suppliers & then you list their products for sale on your website (so you’ve also got to build a website). Then when you make sales you contact the suppliers & have the items shipped directly from them to the customer, paying them the money that the customer paid you & keeping a profit for yourself. Make sense? Seems pretty good at a glance right? But this is assuming you actually manage to make sales, because whilst setting up the shop itself & contacting suppliers is pretty easy, marketing it is not & it generally requires a huge advertising budget. And if you’re not an expert in advertising you could find yourself burning through that advertising budget VERY quickly with no real profits to show for it at the end. Sadly that’s what happens to most people who try dropshipping. Again, that’s why I always recommend affiliate marketing instead. With affiliate marketing you don’t need to worry about handling products, talking to customers or dealing with refunds – all you need to focus on is connecting customers with the products they’re looking for & you get paid commissions in return. Plus with affiliate marketing you can get started for free at places like Wealthy Affiliate. So yeah, dropshipping seems good but in my opinion it’s not. The reality here is that the creator of the Ecom Cash Crusher system isn’t actually interested in your success at all & that’s why the program is only $37. The only thing he’s interested in is making some money at your expense. He makes the whole thing seem way easier than it actually is & he’s put the price at a point which might make you think “what the heck, I’ll try it out” – but on the other side the training is extremely basic & the chances of it helping you find success are extremely slim indeed. On top of that there are also several upsells on the other side too so if you think $37 is the true cost then think again. As soon as you enter the program you’ll be bombarded with offer after offer with each one promising you quicker & bigger results but really they’re just drawing you further into the scam by getting you to spend more money. Even if you bought every single upsell on the inside the training (in my opinion) is nowhere near good enough to help you see true success. Then once you’ve gone right through the program it finally leads you into something called My Ecom Club which is yet another dropshipping program that costs thousands of dollars. Despite it’s cost though I don’t feel the value in that course lives up to it’s price either, that’s why I gave it a thumbs down in my review. So yeah in short if you’re truly stuck on the dropshipping method I’d still definitely steer clear of the Ecom Cash Crusher system because it’s not a good place to get started with it. It’ll just see you losing money & feeling disappointed. 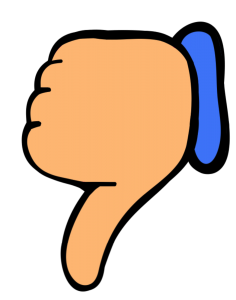 My Verdict – Is Ecom Cash Crusher a Scam? I know this will probably be quite a controversial verdict since the product does actually provide some training but I am going to say that in my opinion I do believe the Ecom Cash Crusher system to be a scam. The reason I say that is because whilst it doesn’t necessarily pull money from your bank account & give you nothing in return, I do feel it’s way too hyped up & therefore what you get isn’t really what you were sold. 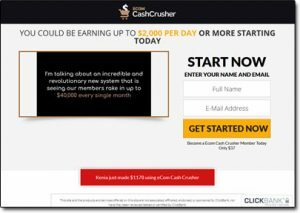 You see if you hand over your cash to get access to the Ecom Cash Crusher program you’re going to be expecting a done-for-you system that’s almost immediately going to start generating you good money & that’s not what you’ll be getting. Instead you’ll just be getting some basic training on making money via Ecommerce. It’s clear to me that the creator has just set it up purely so that he himself can earn some cash at your expense – he isn’t really interested in helping you see success like he claims… He just wants to get as much money from you as possible. So for that reason I am not going to be recommending the Ecom Cash Crusher system & instead if you truly want to learn how to make good money online then I highly recommend you check out affiliate marketing instead which in my opinion is a MUCH better & easier method. Plus don’t forget that there’s also a whole bunch of other ways you can make money online too which you can check out here.